On Friday I skied straight into the light at the end of the tunnel. I really wasn’t sure that I was ready to go back to Whistler. My knee spent two days aching like a rotten tooth after eight hours on my feet at work on Tuesday. My early ventures to the north shore were gratifying – after all, I was skiing – but conditions had been too poor to get any real sense of what the knee was capable of. The longest I’d lasted had been four hours, and that was on relatively short runs. Add in a forecast of heavy snow and a poor night’s sleep, and I set out on what should have been my biggest day so far feeling nothing but nerves and trepidation. The Sea to Sky was a picture postcard winter wonderland. Snowladen trees, heavy cloud gashed by streaks of blue, and compact snow from the Callaghan Valley all the way into Whistler. We must have passed a dozen cars abandoned in the snow-filled ditches beside the road. The drive soothed my nerves a little. I’d missed those winter morning rituals so much: the crack of dawn alarm, a bleary start in the dark, the twists and turns of the road that just briefly interrupts the mountainsides that roll from the sky right down into Howe Sound. At Creekside I geared up, expecting nothing much. As we climbed into the gondola I made myself vague promises about taking it easy and just seeing how long I could last. I looked down at skiers cruising the powder runs, and vowed that I’d be happy enough just seeing how well I could carve on the groomers. And then I hit the mountain, and finally found the day that I’ve been waiting seven and a half months for. I skied, and I skied hard. I skied hard from the moment we arrived (about 9.30am) until the last chair we could convince the lifties to let us on (about 4pm.) I skied on gorgeous soft groomers where I carved perfect turns all the way down; I skied on Peak to Creek at the end of the day when it was cut up into gnarly bumps; I skied in beautiful soft chopped up powder and I skied my legs off on the Dave Murray Downhill. The caution lasted barely a run; having those amazing expanses of mountain in front of me, covered in fresh snow, was just too much to resist. By lunchtime I was tearing down Dave Murray and Tokum in about three minutes flat, ripping the mounds of soft snow to shreds and carving beautiful snaking s-turns at full speed all the way to the lift. Every single time my left leg forced the outside ski into the snow, carving or smearing another huge arcing turn, my confidence grew. All my fears about lost technique were completely unfounded; it’s still there, everything I learned last season. I did stay out of the big bowls and deep powder (not easy when there’s a huge storm overnight), but I skied hard and fast and so much better than I expected. By the last run Dave Murray was a mess of bumps and I was flying a foot in the air on the outside of every turn. Probably not exactly what the doctor ordered, but psychologically it was an enormous boost. Friday was every single thing that I’ve been missing. It was the reassurance I needed that nothing is gone, nothing is lost, and fear isn’t going to hold me back. There’s no psychological hangover from the accident and injury. And if I can ski like this when my left leg is still weak and I’m still hampered by concern for the graft, then I will at some point in the future be as good as – and better than – I was before. It may not be this season, but it will happen. On the last run of the day I was still skiing fast and carving hard all the way from the top of Big Red to the foot of the Creekside Gondola. At the end of the run, the only thing I wanted was for the day not to be over. This is why I made the choices I did and struggled through the whole long nightmare of surgery and rehab: these moments when the only things that matter are the snow and the speed and the skis between. These moments of perfect harmony with the mountain. It’s been a long road and I’m not done with it yet, but on Friday I truly felt like I’d come home. 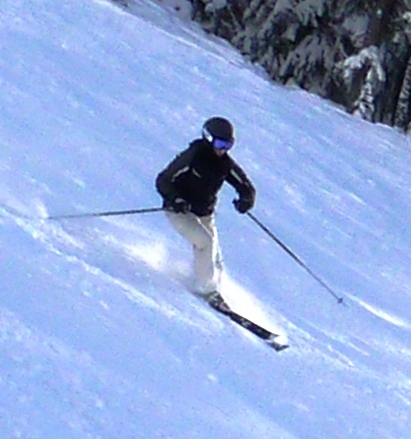 This entry was posted in Skiing, Whistler Blackcomb on February 20, 2011 by Kay.